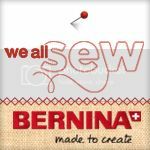 I shared a fun tutorial this week over on We All Sew - the Bernina USA blog. Go check it out! Share it on Pinterest! 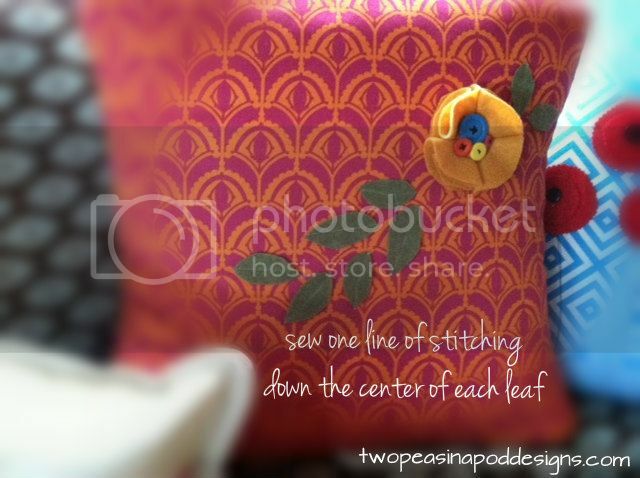 Make some for your sewing friends for the holidays! Wear one to a party - they are too cute! 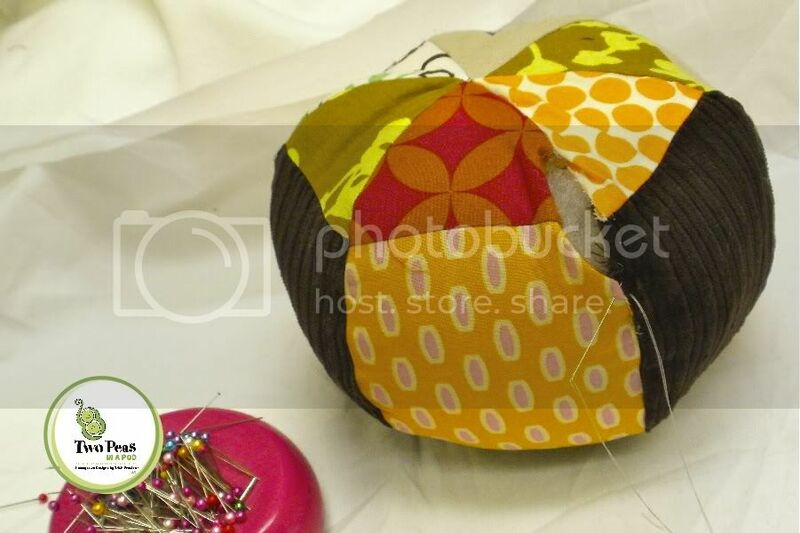 Find the RING PINCUSHION TUTORIAL here! I think this may be my new favorite thing for Sprout and I'm pretty sure I need to make one Mommy size. 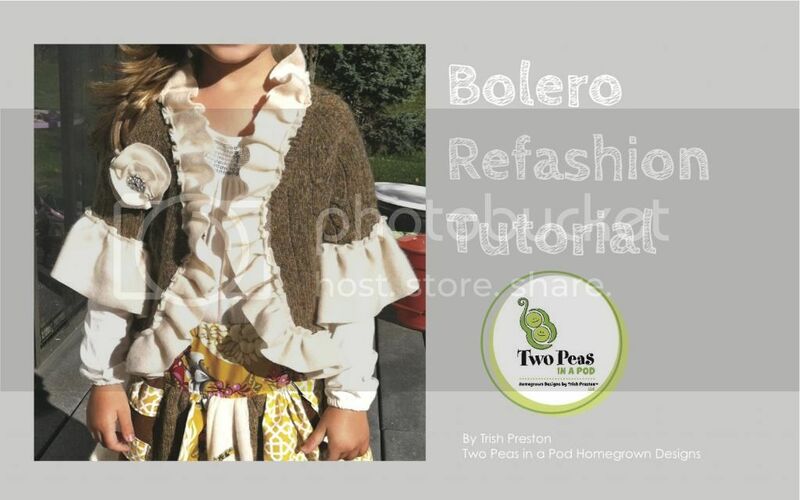 Let me show you how easy it is to make a bolero jacket with ruffles! 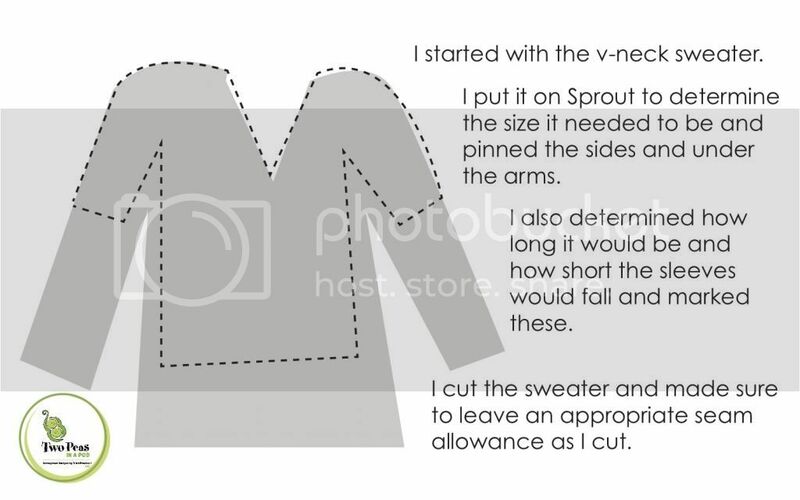 ONLY CUT YOUR SLEEVE LENGTH, OVERALL SWEATER LENGTH, AND SIDE SEAMS. DO NOT CUT ALONG THE SHOULDERS - I just realized the dotted lines run up the outer edge and shoulders - duh! Don't cut there or along the v-neck! Leave the v-neck intact for now. So, there it is. 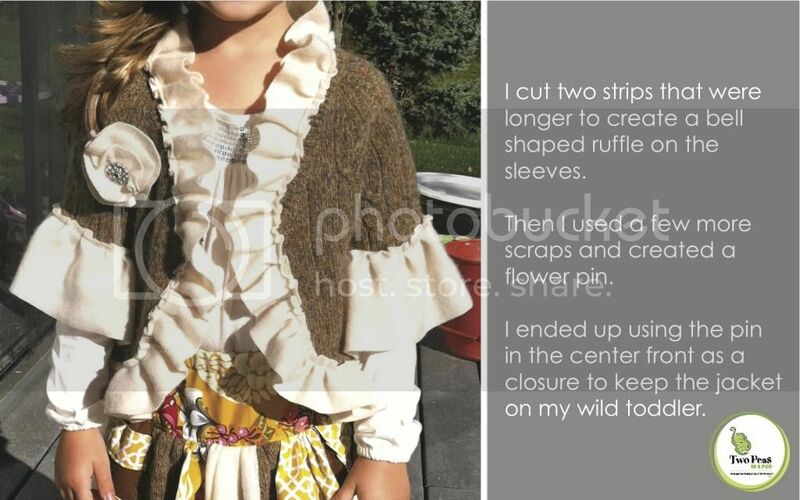 My bolero refashion with ruffles. It seriously was super easy! 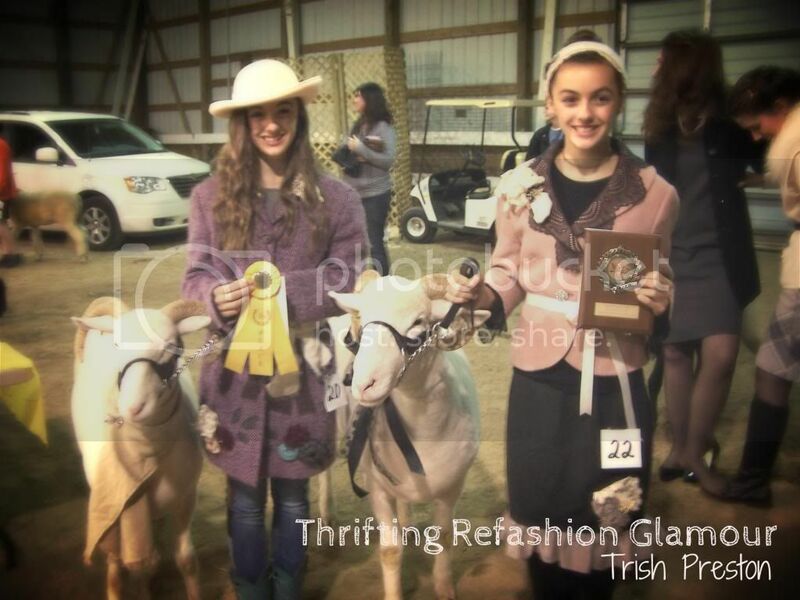 Go forth and thrift, refashion and sew! This past Spring, one of my friends asked if I would help her surprise her neighbor with a little home makeover. The Gardener and I were delighted to help. My friends church came in tore out the carpet in the lower level revealing amazing hardwood floors that got shined up. They painted the walls too with a bright clean white and one accent wall in a Tiffany blue that was amazing. The stars aligned for this project. I wish I could show you ALL of it but we were so busy working I only got a few pictures. I can tell you this...Mostly what we learned from this project is that a little spray paint does wonders! But you probably already knew that! Another set of friends of ours had recently gotten married, combined households and were unloading some furniture. We were able to snag some pieces to put into the house and give the neighbor a few new items. Ok...maybe more than a few. What a blessing! The best part was we added a dining room table into the kids play room to give them a crafting / homework station that didn't exist before. Giving furniture new life is so much fun! 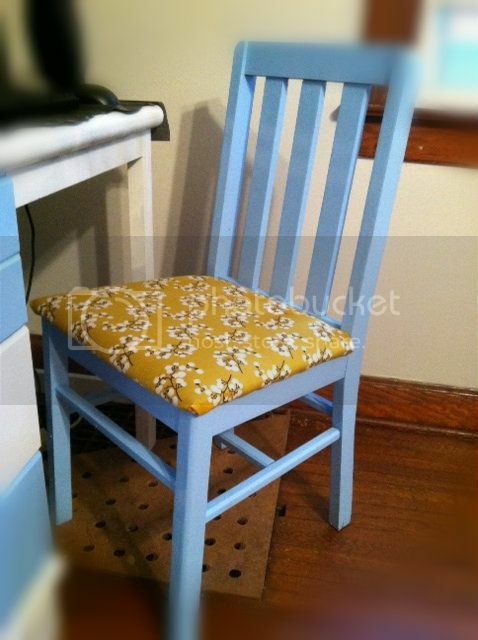 One of the old desk chairs got a facelift...some new blue paint and a new seat cushion. She looks just lovely at the neighbors new computer desk, don't you agree? The desk was one of those dorm room laminated style desks which is like a plastic coating. Great for a college kid but we added some plastic appropriate spray paint in white and blue. It refreshed that old desk for a perfect spot the kids can sit to work on the computer. By far, my favorite piece of the day was the old lamp table. My husbands best buddy owned this lamp, big chunky wood and it had these...kind of awful... looking coasters on each corner that were adhered into the table. As soon as I saw it, I knew exactly what I wanted to do with it. I LOVED how it turned out and I was so excited to hear that this was the neighbors favorite part of the house makeover. Swoon! 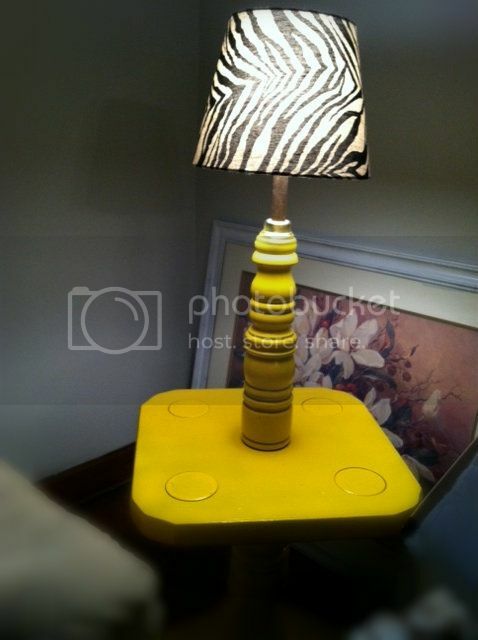 The bright yellow and zebra shade were perfect together. I was given the task to redo / create new pillows for the living room. Here are a few of my favorites. 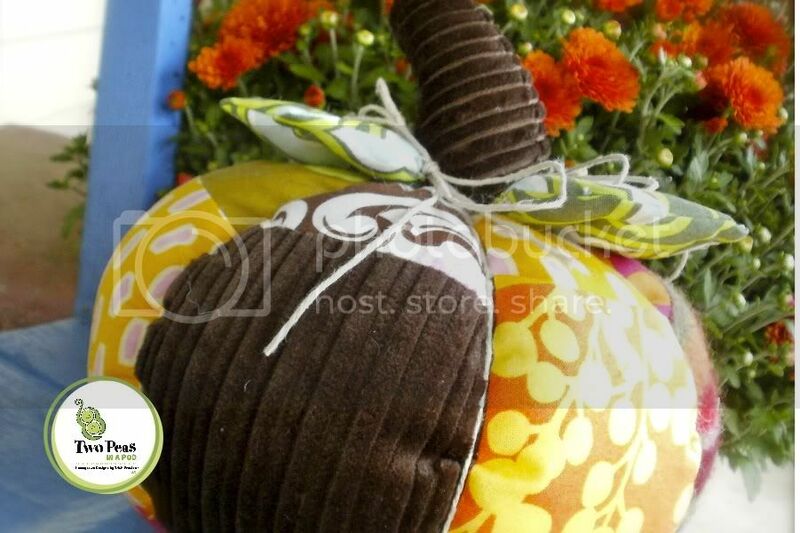 The first one here, I used some home dec fabric from Anna Maria Horner and added felt leaves that trailed across the pillow along with a felt flower. 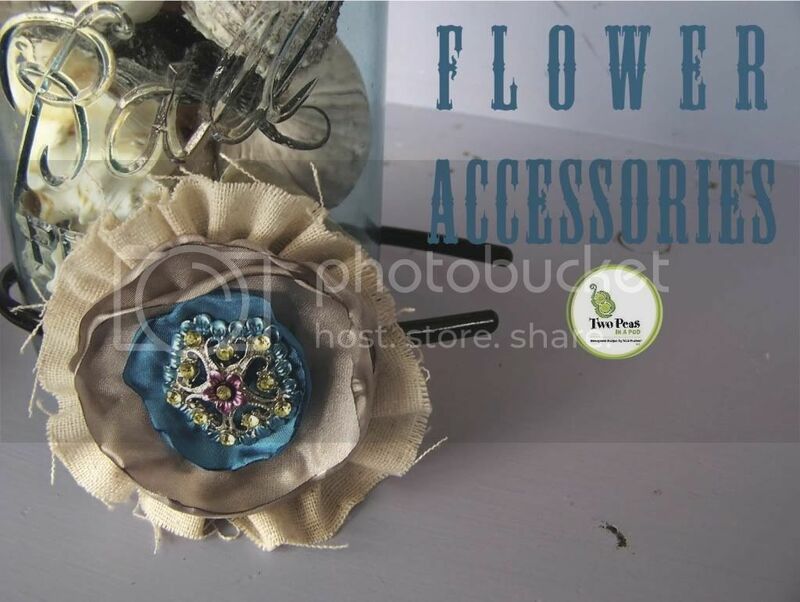 I sewed a bunch of buttons to the center of the flower. 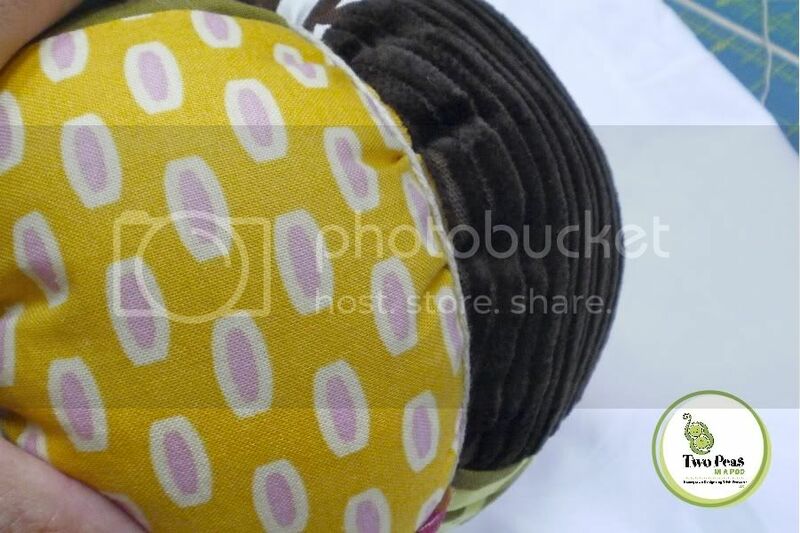 Each pillow I made, I rounded the corners and also made an envelope style closure back. (envelope style is the fastest / easiest style and since I had a stack of pillows to make...that made my job go by with ease). Round your corners? Yes...otherwise you end up with these dog ears that don't fill out. Just a tiny rounding of the corner will resolve that problem. A familiar and much loved style...a pennant banner with the added word LOVE stitched into it. Using a disappearing ink pen, I drew the lines for my banner and the word LOVE. I stitched using a stitch length of about 3.5 with black thread and went over each line at least twice. I raw edge appliqued the banner flags - stitching a straight stitch just along the edge. I made the pillow a little bit large and then using a decorative topstitch, went all along the outer edge. This Sis Boom print paired so well with the bright red poppies. 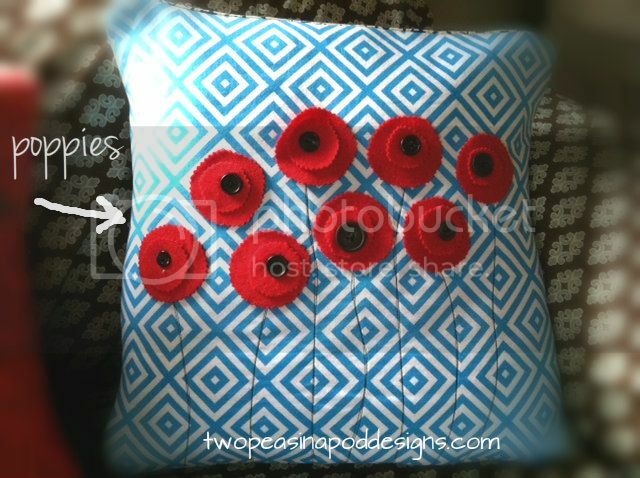 Layering felt circles on top of one another and adding a black button center plus a line of stitching for the stem created this field of poppies on this pillow. So bright and cheery! We worked really hard for about 3 days on this project. Sewing. Painting. Cleaning. Moving. Blessing a sweet family with some sunshine. 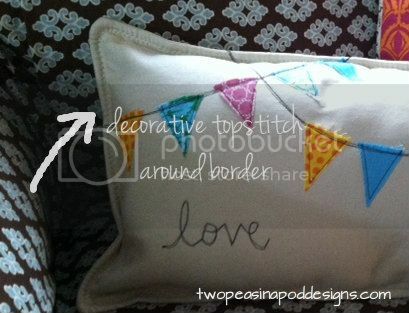 I can't wait to make a few of these pillows for my own house...maybe this "crafternoon". 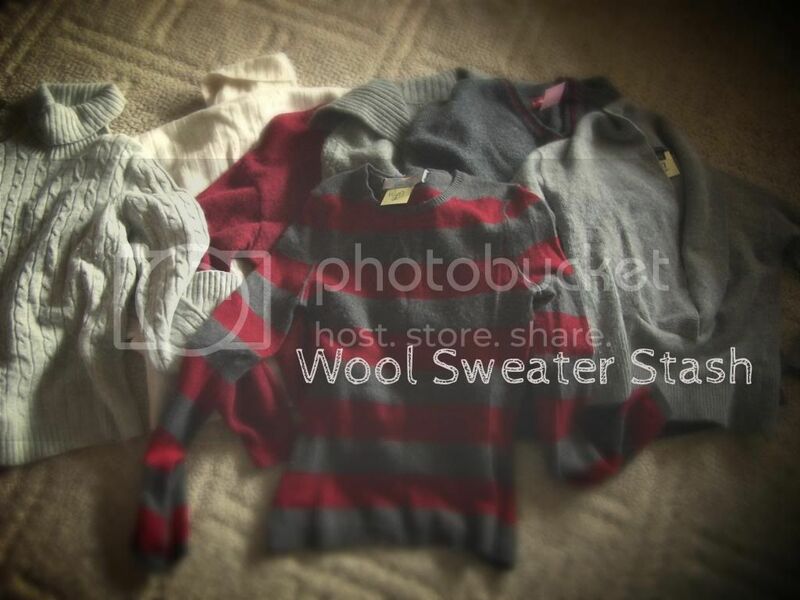 Weekend Crafternoon is a new feature I'll be sharing regularly on my blog. Sharing some fun weekend crafternoon projects to inspire you and I hope you'll join me. 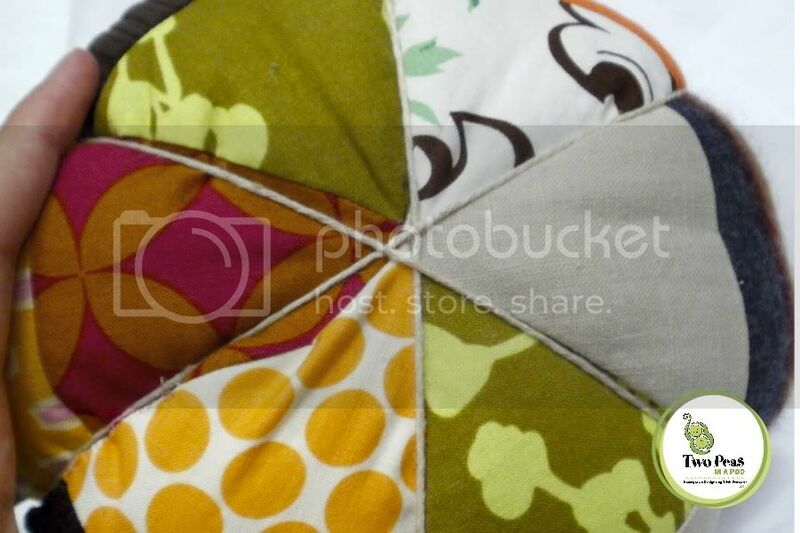 I'll be opening it up as a linky list so that you can share your crafternoon projects too. slowly easing back into things...I have a literal mountain of work, laundry and thank you notes before me. Catching up is the name of the game currently. 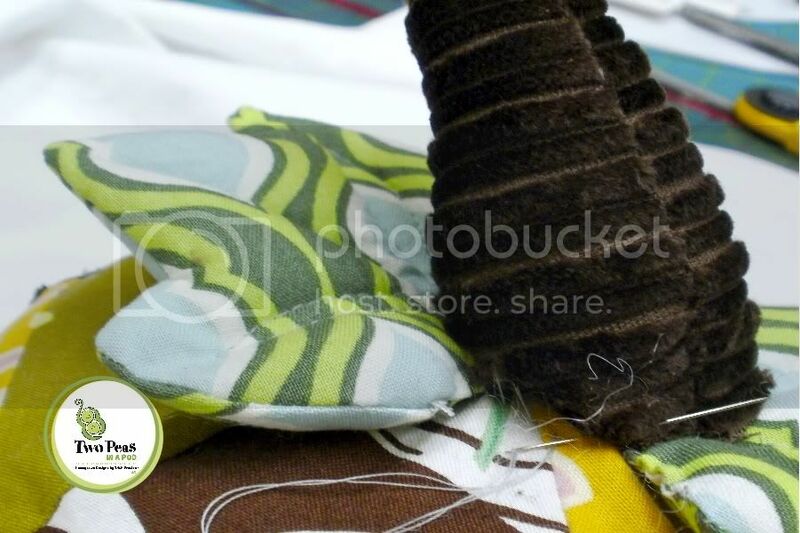 Over the weekend, I had fun sewing up a quick sample for our Schoolhouse Clutch Sew Along. It's not too late to participate - just grab a copy of the pattern from your favorite retailer or from our shop and join in. 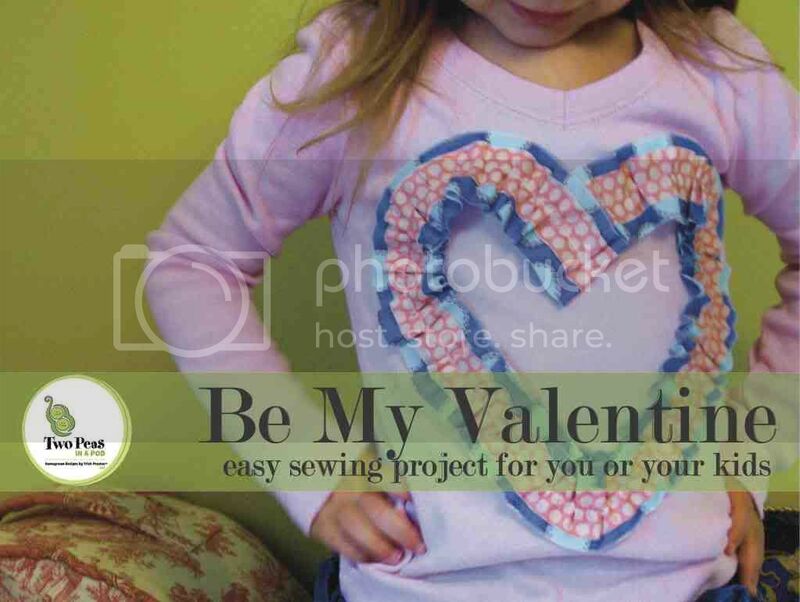 Since I posted about the sew along early in February and then went on hiatus with 24 hours afterwards (see February post...spent with family) we lost out on promoting this sew along. BUT if you participate, I promise I have something fun just for you! Send me a copy of your receipt showing me you purchased the Schoolhouse Clutch pattern and I'll send you the link for the private post on how to add an easy zippered pocket to the inside of the bonus mini-journal included in your pattern PLUS a few little design tidbits. And there may be more...just saying. Take a moment and say hello if you will...I always scratch my head in wonderment at the number of hits this blog gets vs. the number of comments that are left. Hello? I'm real, not a robot...and I'd love to connect with you and get to know what you are crafting up. Introduce yourself...I'm so glad you are here. I'm not a quilter. Not even close. Although I do quilt. 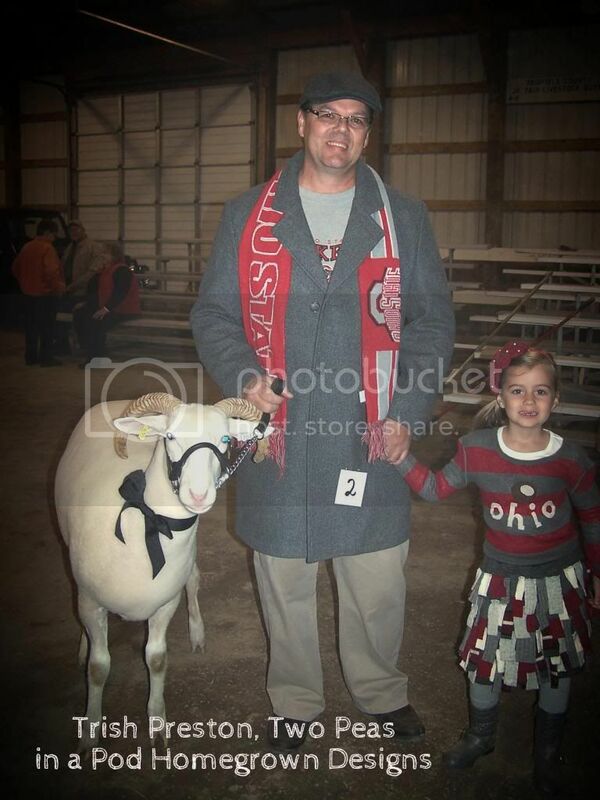 I really don't consider myself a quilter. But I love quilts. I cheat at quilting. A lot. Blanket quilts...that's more my speed. Instant gratification. 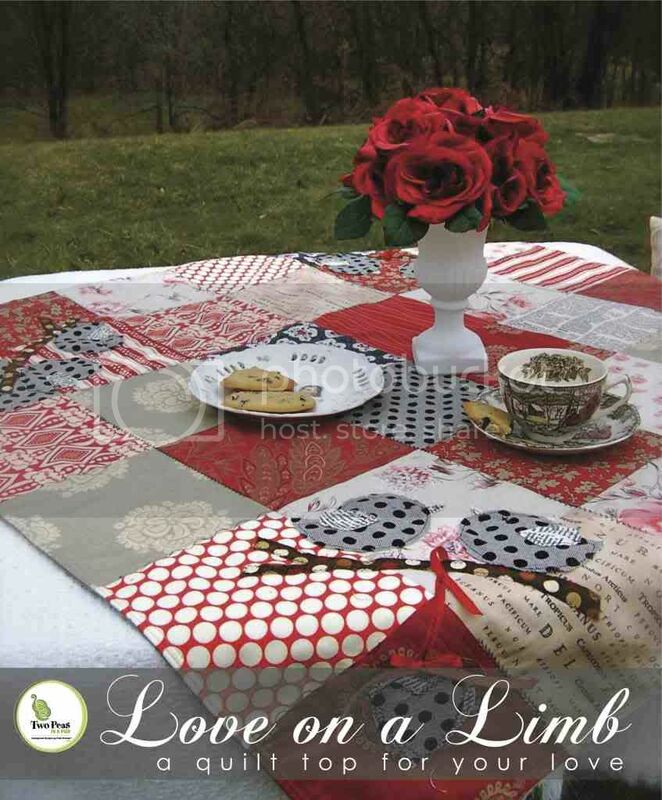 My Love on a Limb "quilt" has been used in so many ways. For awhile, I used it on a table top. But for at least a year, it has graced the center back of our family room couch. I love it. Sprout often uses it to cover up with as it's just her size. 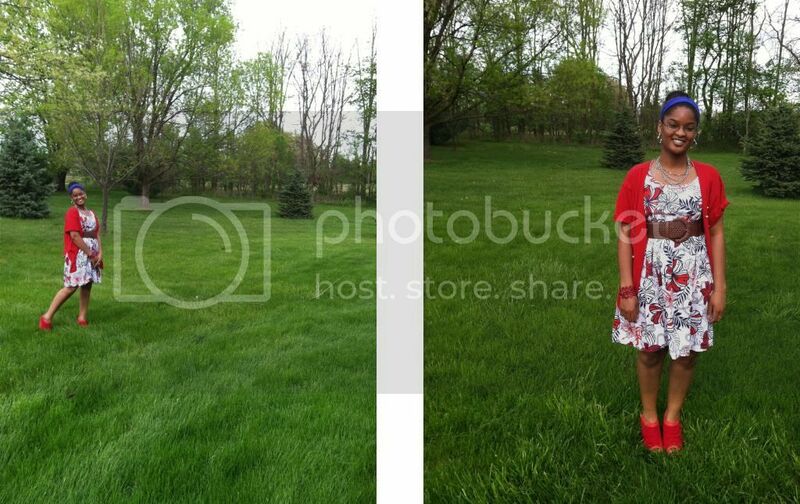 The fabrics I used were from Moda / French General along with some others thrown in the mix. And Moda has some really great selections that would work well for this project. My favorite right now is Sweet Water - Authentic line. Check them out at your local quilt shop. Go Sew! 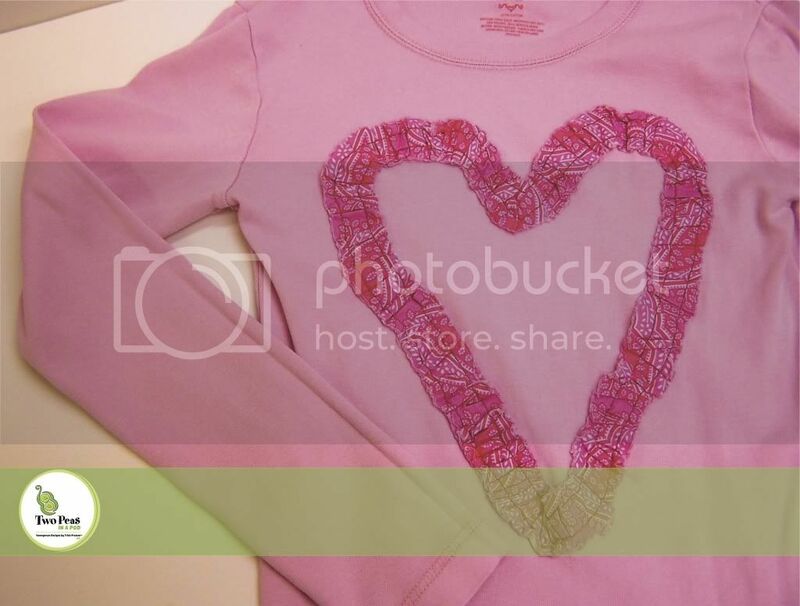 Make something for your love this weekend - check out this tutorial for my Love on a Limb project. 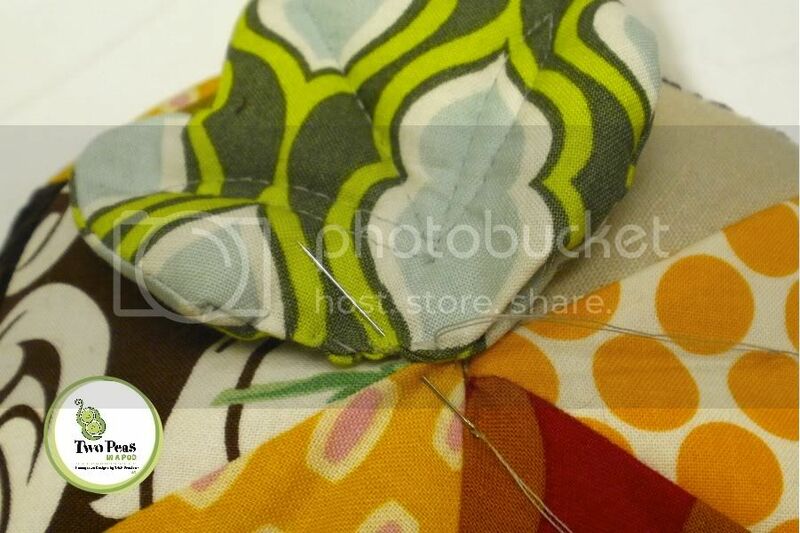 Last year, about this time, my peas and I sat down to this sewing project. 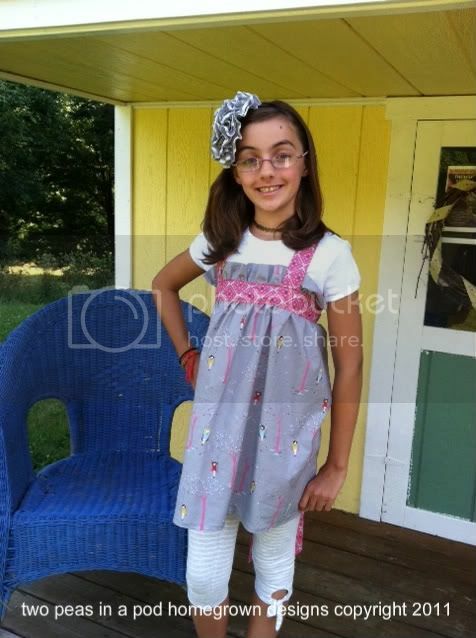 If your son or daughter is begging you to teach them to sew - here is an easy peasy project they can wear. They will love telling everyone they made it themselves (ok, no, I doubt a boy will wear this BUT wouldn't he love to give this as gift to his best girl from down the street or maybe a teacher or his sister, etc! Boys need to learn to sew too - I firmly believe. Both my husband and my Dad are competent sewers). This is also an easy project for you! 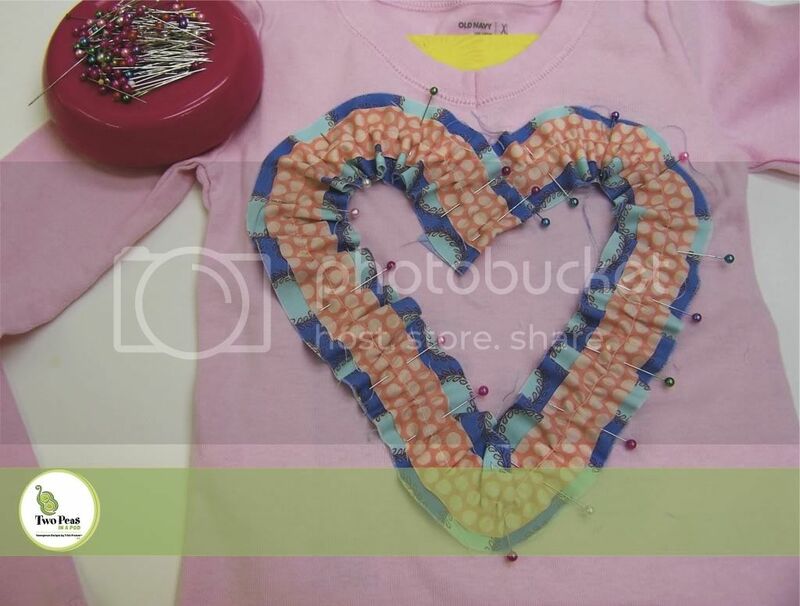 With a blank tee and some strips of scrap fabric and about 30 minutes, you can create a super cute Valentine tee (and hearts you can wear all year round - not just for Valentines). 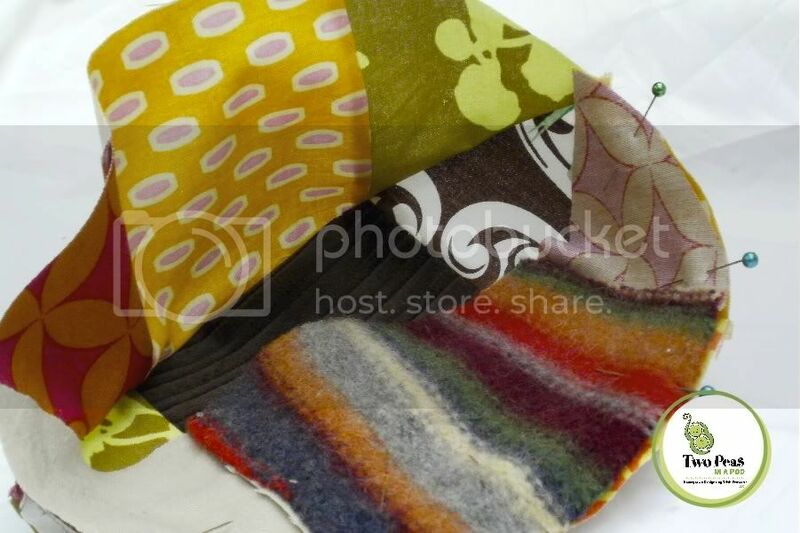 To start, you will need 2 strips of fabric cut 1 3/4" wide x 68" long and 1" wide by 68". The length may vary based on how big your shirt and thus, how big your heart is but that length should be a pretty good fit for all. If you don't like the look of raw edges, you can serge all along the long edges of your strips (or use a zig zag stitch) to finish the edges. 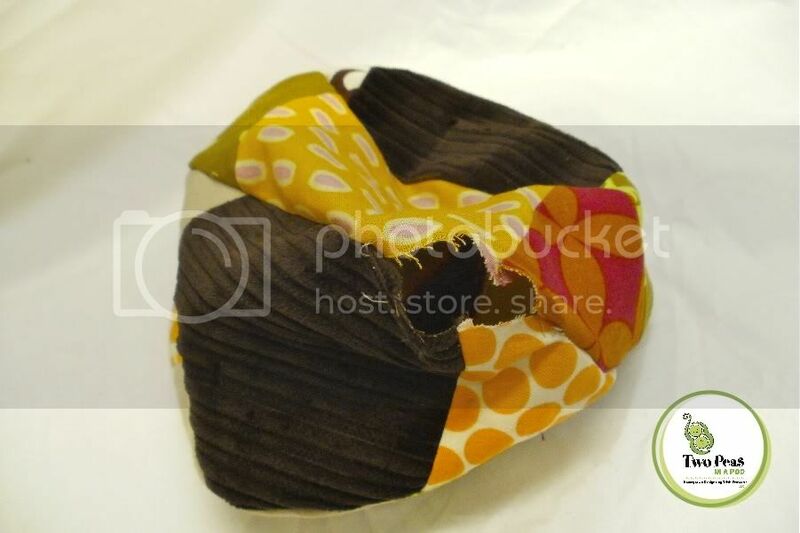 Next, layer your strips together and using your ruffler foot OR a gathering stitch, gather your strips. I did a gathering stitch on mine using a stitch length of 6 and set my tension at 6. The higher you set your tension, the more gathered in will be. Looser tension, looser gathers. Adjust to your preference. Next, we are going to draw our outline of the heart on the shirt using a disappearing ink pen (you could also use chalk if you'd like). I did not use a template but rather, freehand drew my heart. You could always fold a piece of paper in half and draw half a heart on the fold and cut it out to create your template (remember doing that in school?). 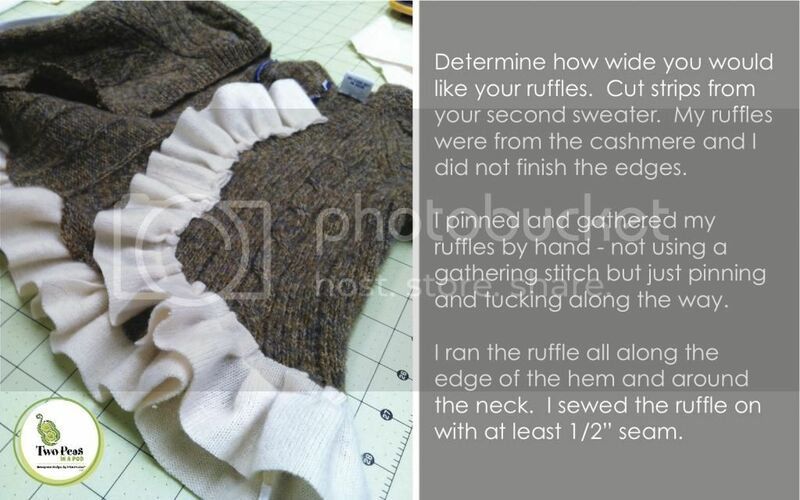 Now, pin your fabric ruffle along your heart outline. I started at the top center and folded under my end. I also put a book inside the shirt to make it easier to pin so I wasn't catching the back side of the shirt. Stitch right down the center following your gather stitch. That's it kids. Simple. Cute. And your kids can do this themselves. Since the ruffles are 1 3/4" wide and sewn in the center, when you go to wash this - just a heads up, in the dryer, your ruffles are gonna go wild and not lay flat. SO, you may want to finger press your ruffles down when it comes out of the wash and air dry your shirt. OR you can follow this idea from the shirt my Two Peas made last year. This is the shirt my peas made last year using a single strip of fabric cut 1 3/4" wide. 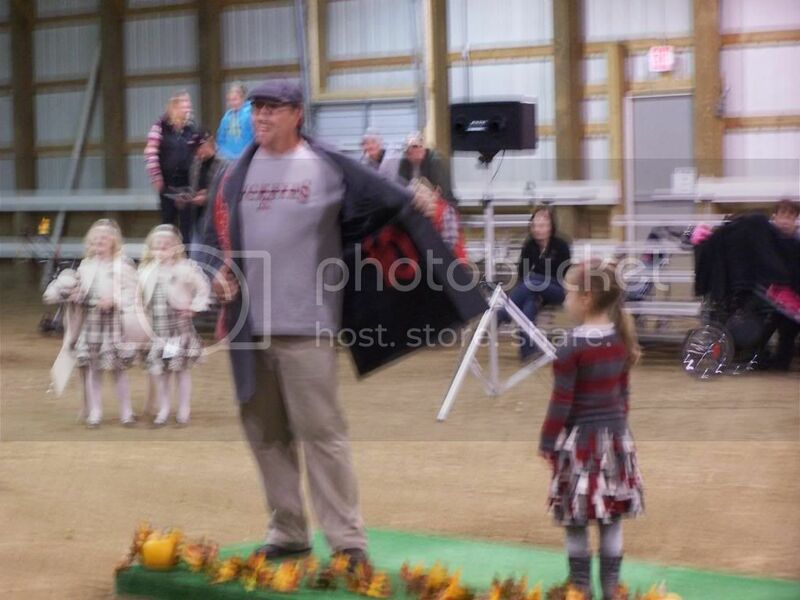 They ran a gathering stitch down the center and then pinned the fabric to the shirt. Instead of stitching down the center, they stitched along both edges as you can see in the photo. That way, the ruffles stay put and the look nice when you throw the shirt in the dryer. Sprout LOVES her shirt (she's napping right now in this outfit in fact - won't take it off). She's also a big ham. 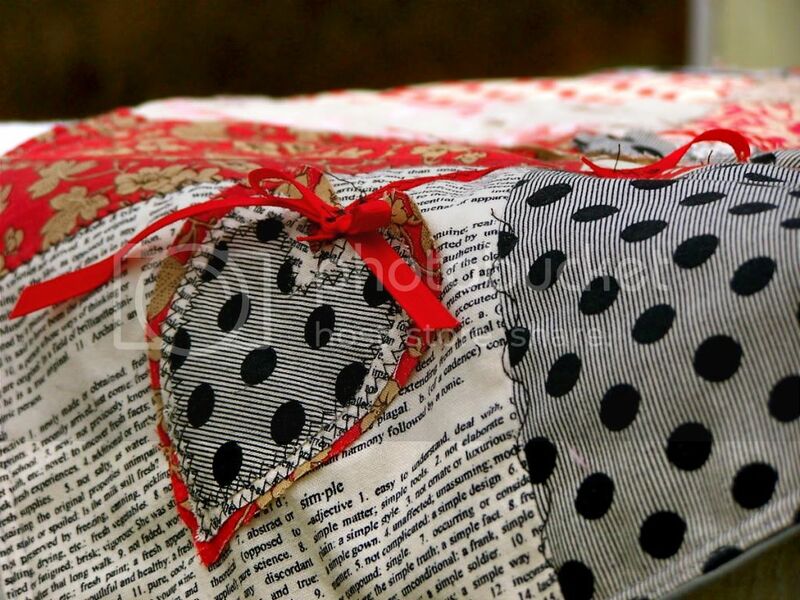 Happy sewing and sharing the L.O.V.E. A new year, a new look to my Monday Morning Inspiration posts. Calling it now "Sew Inspiring" where you can meet some of the very inspirational crafters, sewers and artists right in your own neighborhood. Or in the next state. Or across the ocean. You get the idea. Join me on Mondays to meet some inspiring artists. Want to be featured? 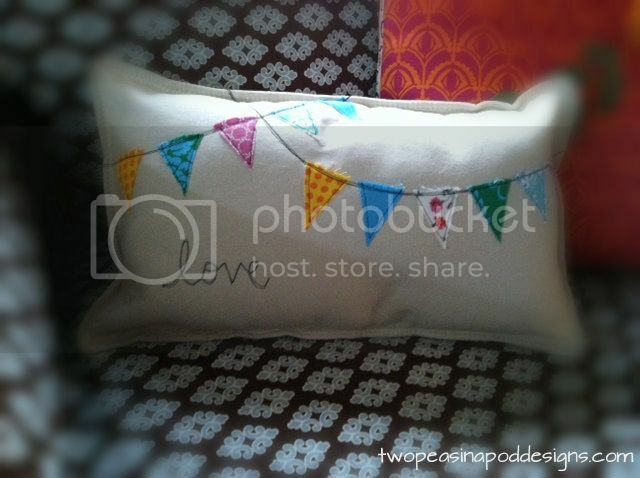 Just send me an email...twopeasinapoddesigns at gmail dot com. 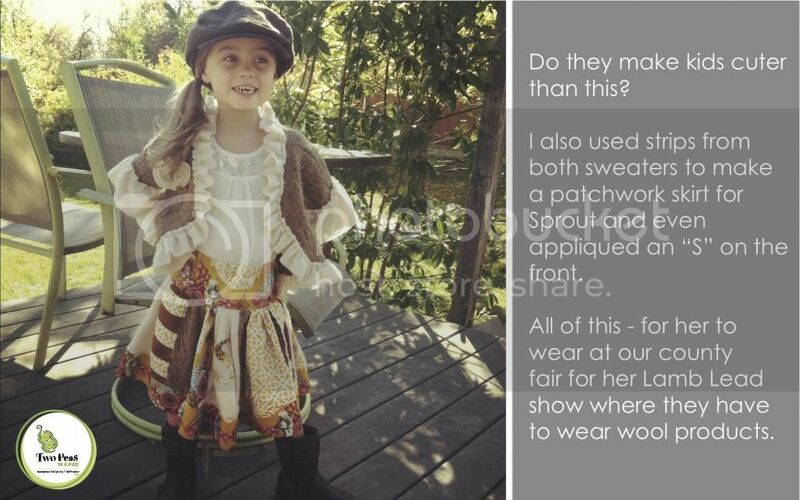 It is my pleasure to introduce to you today, the adorable Caroline from Sew Can She. It’s funny how life leads you in ways you would never expect. I cannot remember ever not sewing, I guess my mom taught me that young. My sewing machine got packed away for college however, and then I loaned it to my sister for a while. It wasn’t until I had babies that I decided to start sewing again. But then, I might have cracked had I not had sewing to escape into for a while each day. It was like I could sit down at the machine and my worries would fall away. It saved me. 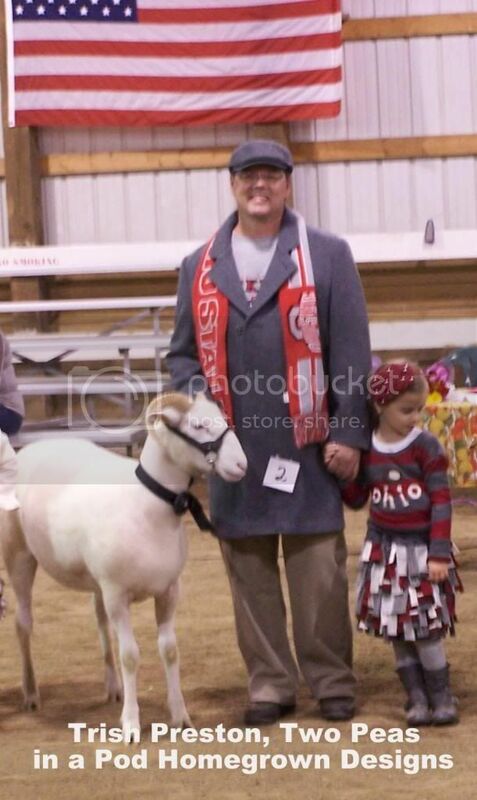 Then I started making pdf patterns and a little company started. 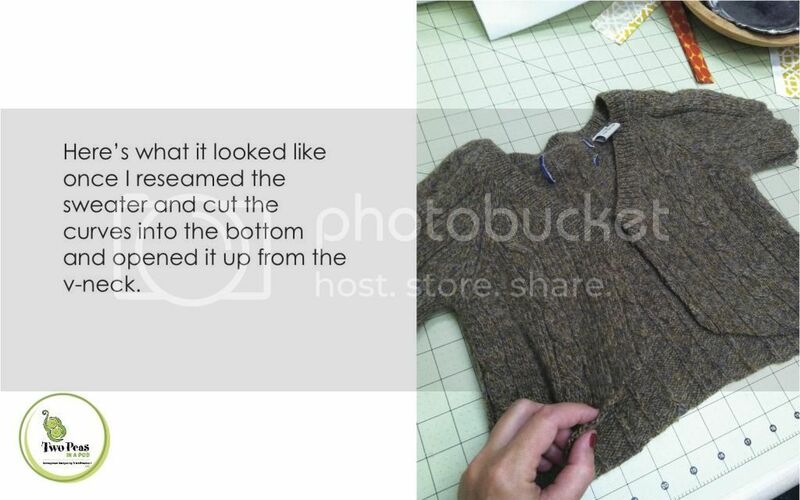 But eventually I knew what I really wanted to do, and that was make a site where people could be surprised, delighted, and excited each day by a new sewing tutorial. And, where I could help all those great tutorials out there get noticed! 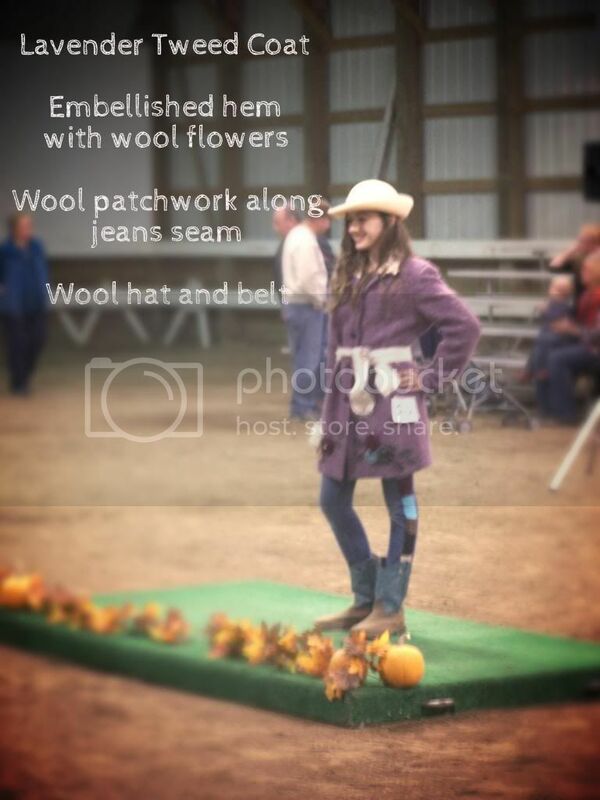 My daughter Chloe is my inspiration. 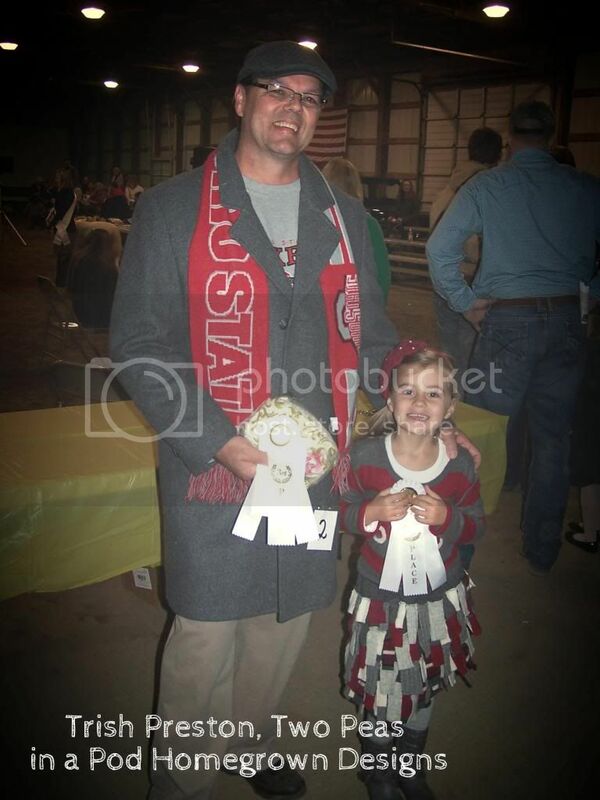 She’s only 6 but she has more creativity in her little finger than an entire Hobby Lobby store! Really. I know you don’t believe me, you think it’s just the mom in me talking, but she blows me away. Someday she is going to really make something. I don’t know what yet, but you just wait and see. I know I should say computer because I am on it so much, way too much. But I have such an emotional tie to my sewing that I think I would die without a sewing machine. You’ll never catch me lovingly oiling and talking to my computer, but my sewing machine – all the time. This is easy. Being a part of the online sewing/blogging community. All of the sewing, blogging moms and grandmas I have met have been so cool, so sharing, and so real. Find what makes you happy. What makes the stress melt away. And what gives you a chance to share with others. Creative doesn’t have to be sewing or painting. It could be building robots. Funny, just today my sister said to me ‘the ideas you have next year will be completely different from the ideas you have today.” I hope that’s true. I don’t want to ever get stuck focusing on the same thing for too long. So, we’ll just have to see! Thanks Caroline for a peek into your inspiring self! Be sure to visit Caroline at Sew Can She for great sewing ideas everyday. Christmas Stocking Pocket Banner - I wanted to come up with a cute decorative item that we could make into a fun activity with the kids. The idea behind this banner is that the pockets will hold scripture and notes from us to our kids along with something fun like a piece of candy. I made this banner to have 7 pockets - one for each day of the week but you could also make a smaller version that includes one pocket per child and refill each pocket every day. You can fill both the little stocking plus the bigger pocket. Bonus! I decided I would have one for each day of the week and fill it a week at a time. I'm hoping their excitement will be contained and they will keep themselves from looking ahead into the next days stocking pocket...I'll let ya know how that goes! A stack of scraps or fat quarters to create your stockings and pockets - the amount depends on how many pockets you are creating. 1/2 yard of lining fabric, 1/2 yard of pocket front fabric is what I roughly used. Plus my scraps for the stockings. 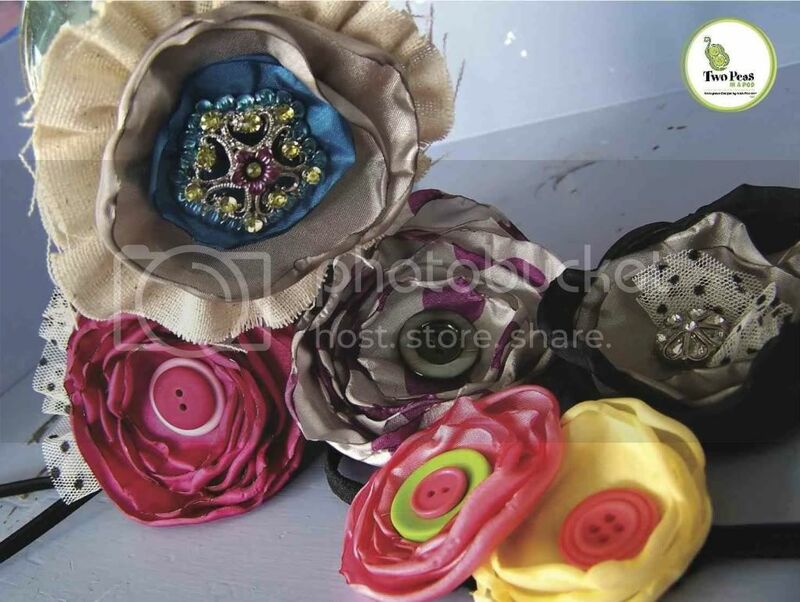 You will also need ribbon or other fabric scraps to create some ruffle embellishments on your stockings. Get creative here! 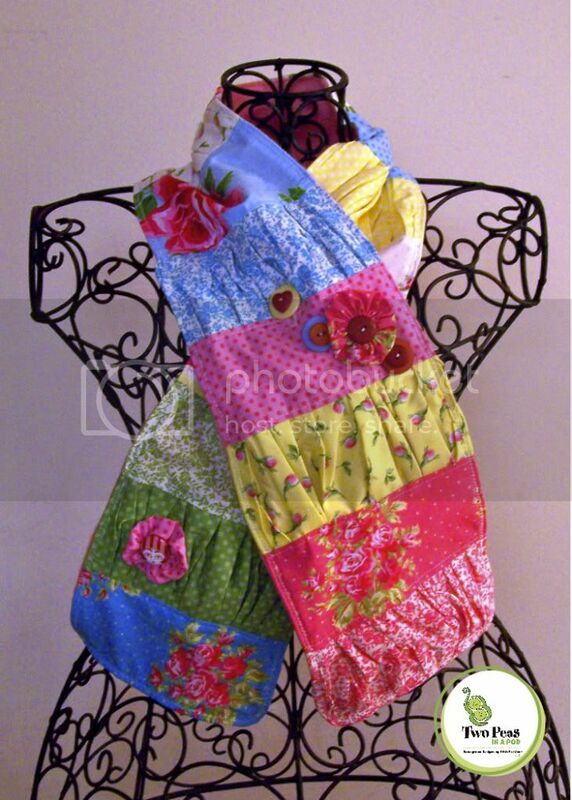 Embellish with ribbon, ric-rac, lace, textured fabric from old clothing scraps like wools, etc. And you will need bias tape for hanging. I again, used scraps of ready made bias tape I had on hand and patched them together. 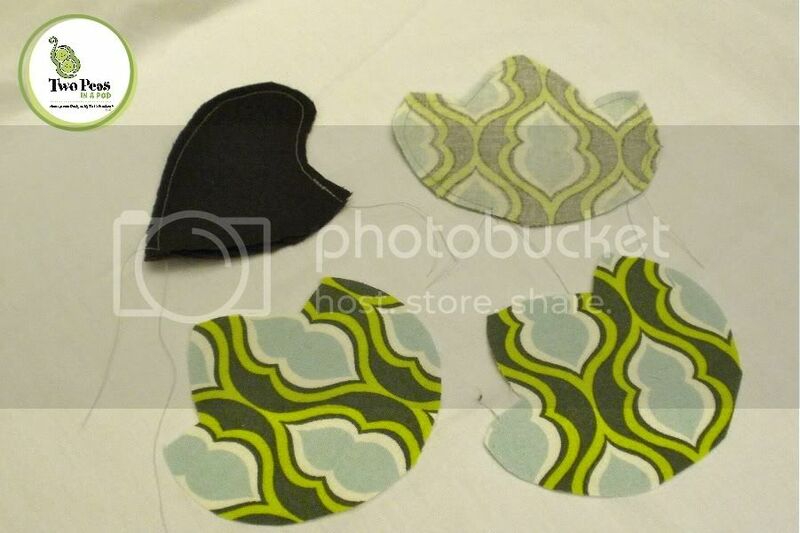 You can also make your own bias tape but cutting your scrap fabric 2" wide and pressing each long edge in towards the center and then in half again. 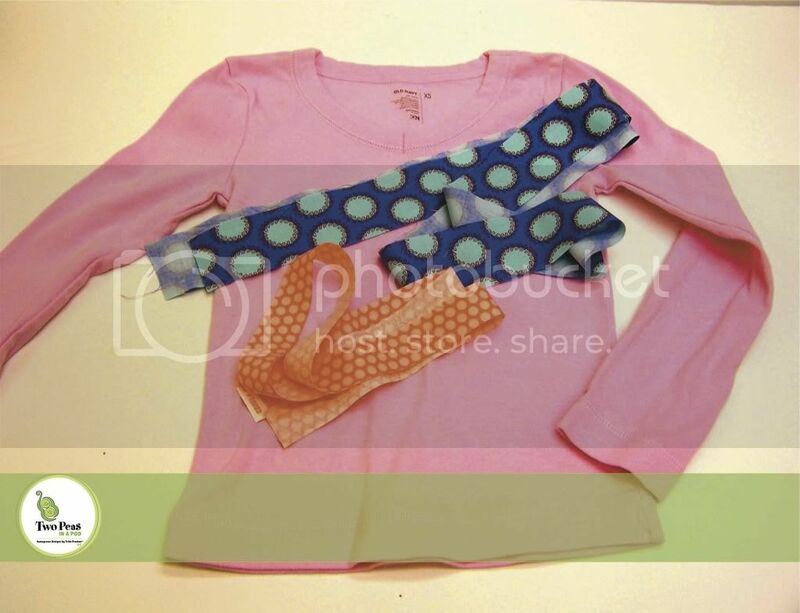 1) To start, click on the pattern and print it out. It has been designed to fit perfectly on an 8.5" x 11" sheet of paper. 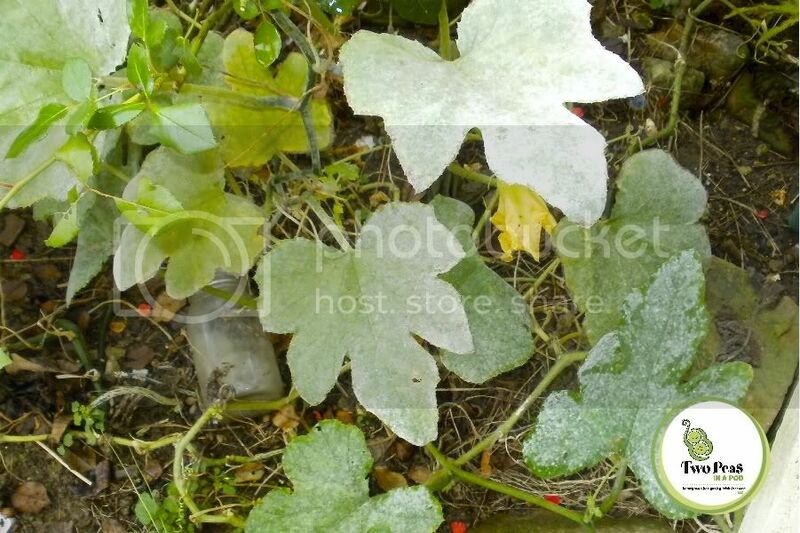 I found that when I went to print this direct from the photo from the blog post, that I needed to increase the size to 125%. You can see that the pockets are the size of a sheet of 8.5" x 11" paper - simply place the corners to the bottom of 8.5" x 11" sheet and cut the corners rounded out as shown on the pattern. Those bottom corner pieces should fit perfectly to the bottom corners of your sheet of paper with 2 1/2" of space between them along the bottom. Make sense? You will need to cut 2 per pocket - a front and a backside of pocket. I used nice fabric for the front and just an inexpensive cotton sheet for my backside of pocket. 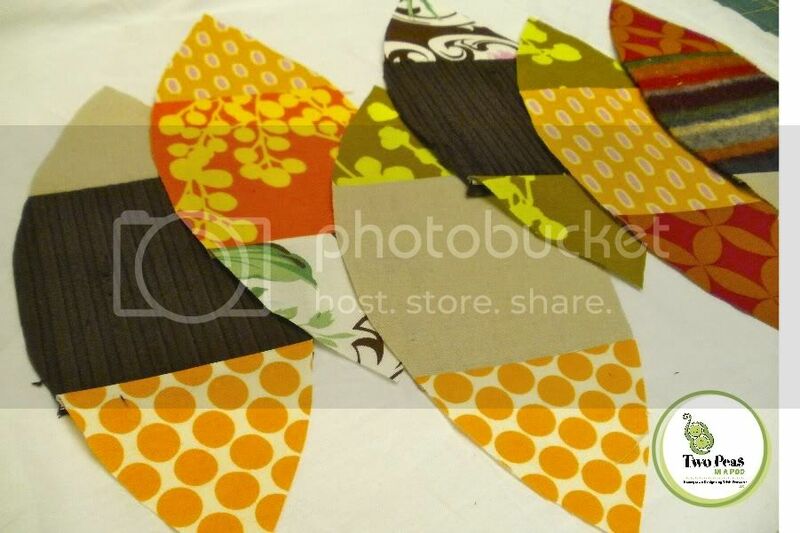 2) Cut your stockings out using the pattern - cut them all facing the same way. Your stockings should be about 8 1/2" tall from the longest points. 3) Pick out your embellishments for each stocking. 4) Next, embellish your stocking. Leave them raw edged (remember, I'm a nap time sewer and frugal - no lining these guys. Leaving them frayed and vintage looking). 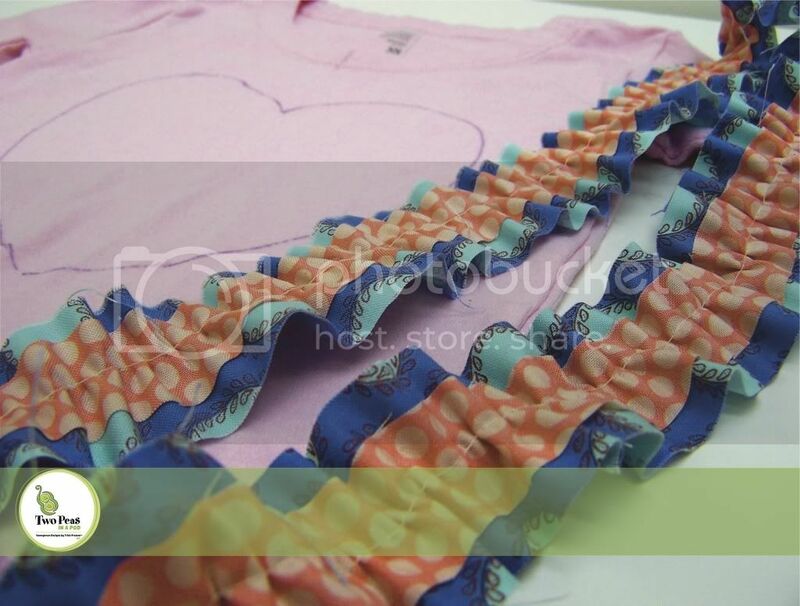 I used ribbon on all of mine to make it quick and just gathered them by hand and pleated and created ruffles. 5) Press under the top of your outer pocket 1/4" and then again about 3/4" - 1". Topstitch to hold in place. 6) Pin your stocking on to the front of your pocket. I used black thread and stitched multiple times haphazardly along the edges (DON'T sew across the top - leave it open so you can stash little treats inside.) to attach my stocking. 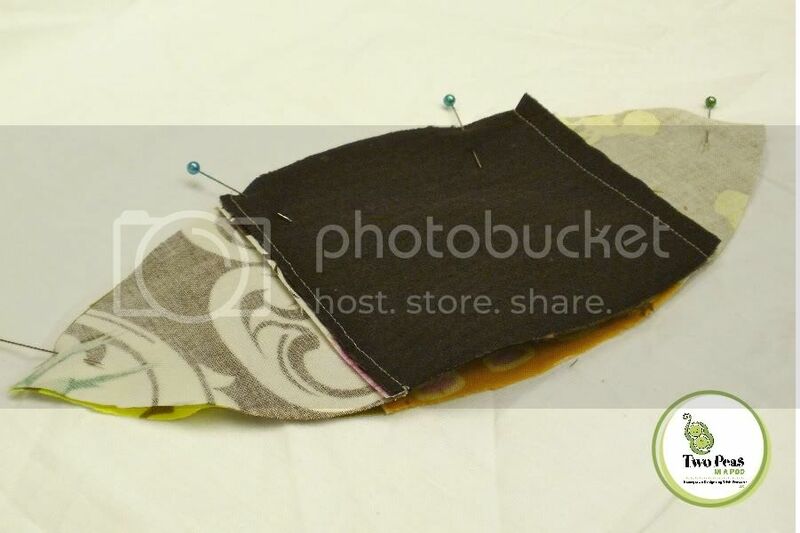 7) Lay the front of your pocket onto the backside of the pocket with right sides facing, pin and stitch. Clip your corners. Say what? That means all along the edges that are curved, use your scissors and carefully, cut a slit in the fabric but DO NOT cut into the seam. This helps to let the item pull and then lay flat instead of puckering along those curves. Turn your pocket right side out and press your seams. 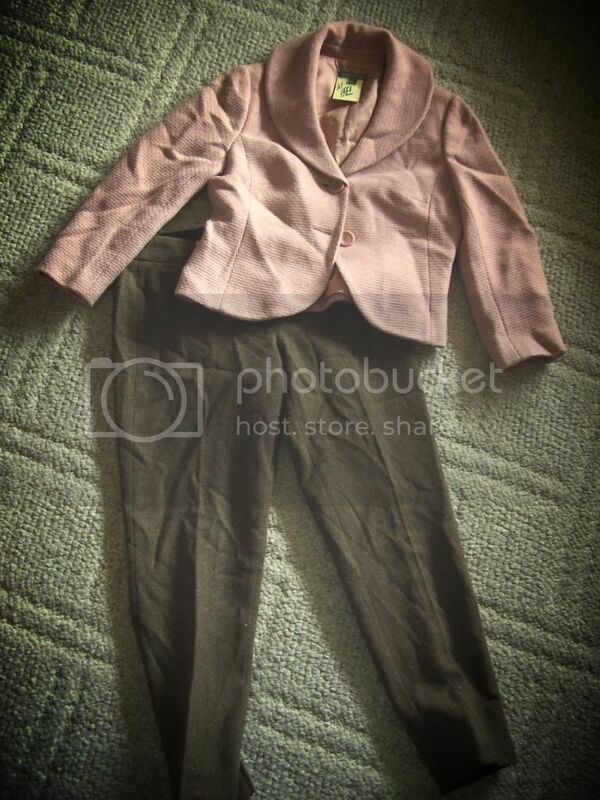 **NOTE** When I'm piecing something like this together, I use a stitch length of about 2.5. I also will use a fresh universal needle for a project like this. FRESH because each time you sew - you dull your needles. If you wait to change out your needles until they break, chances are you are pulling your fabric and distorting it some by using a dull needle. SO change them out frequently. 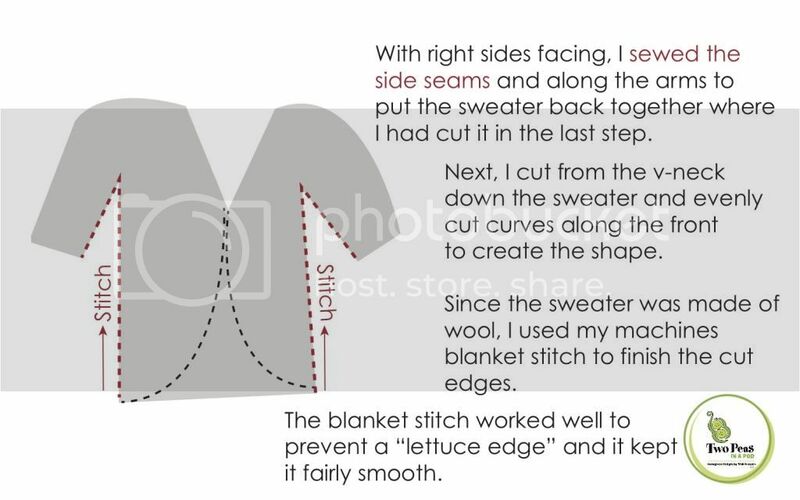 When I topstitch, such as I did when I attached the stocking to the pocket front, since I was doing multiple lines of stitching and doing what I consider a decorative stitch method, I moved to a stitch length of 3.5. 8. Because our pocket is lower than the backside, it leaves us with a bit of a raw edge showing along the edge on the backside pocket - I simply just tucked it under a bit and gave it a press. When it goes into the bias tape, that will hold it in place. 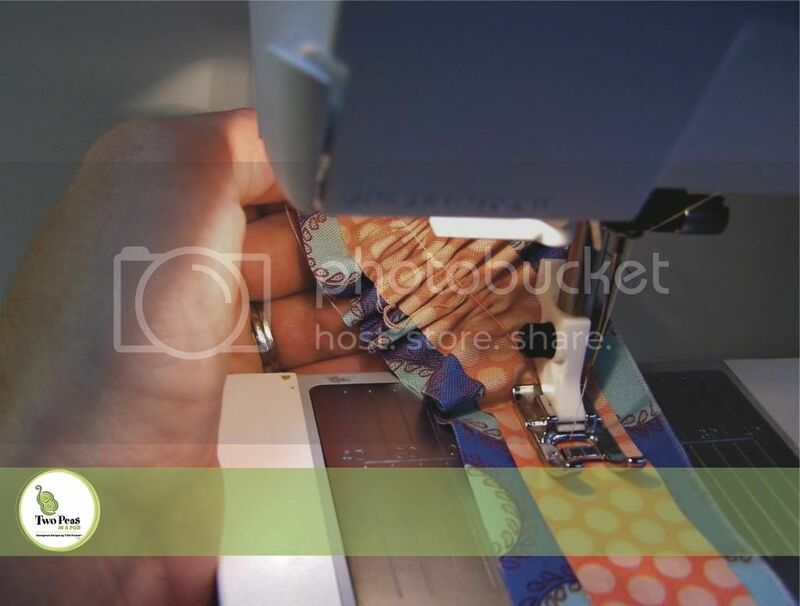 9) Last, to finish up our banner, use your bias tape to attach the pockets all together. Leave about 14" at the end for tying it up. Start placing your pocket into the bias tape. Place your pockets 2" apart along the bias tape. 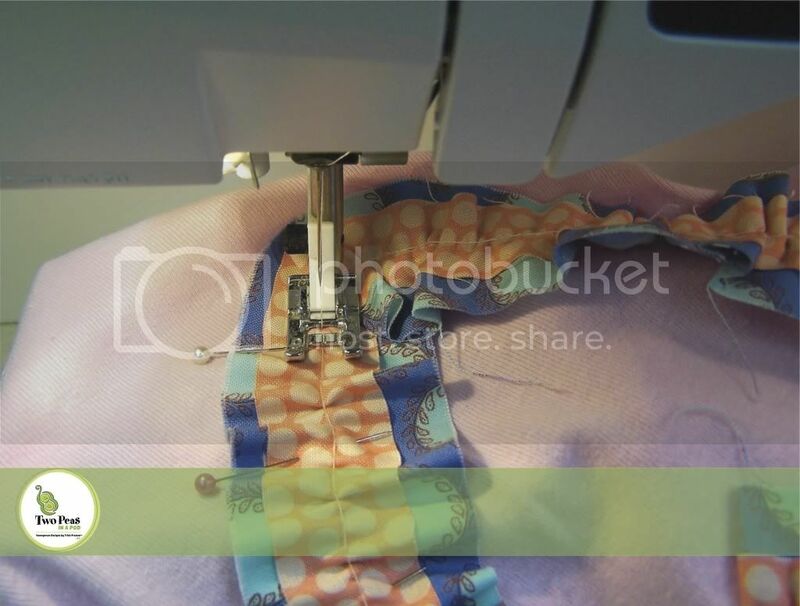 Obvious maybe but just to clarify, open up the bias tape and place the pocket in the center (just the backside of your pocket will reach into the bias tape), pin and stitch down the full length of your bias tape. 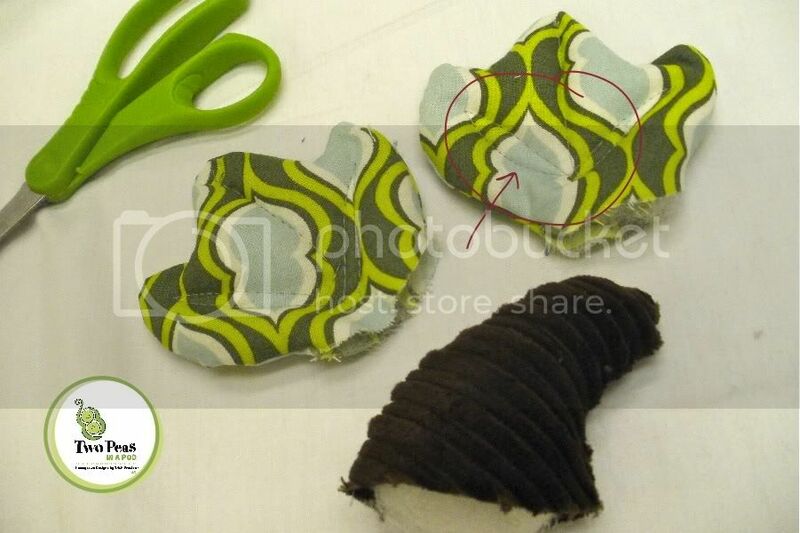 10) At the end, fold your ends under and stitch to create loops for hanging. NOW...let's hear your ideas about what to fill them with!! I had planned little notes and small treats but what suggestions do you have? And if you don't have a mantle to hang this on, this would work perfect along a staircase railing or on the wall. OR you could even sew a much larger version of the stocking onto an old vintage pillowcase and put it on your child's chair at the dinner table - then fill it up and let them find some goodies in there when they go to eat breakfast! I am making my list. My handmade holidays gift making list. Have you got yours together yet? You know what happens, every year, without fail, December 10th or so hits and suddenly I am sewing maniac - staying up late - making all kinds of things for teachers and friends and family. How about a patchwork lanyard? 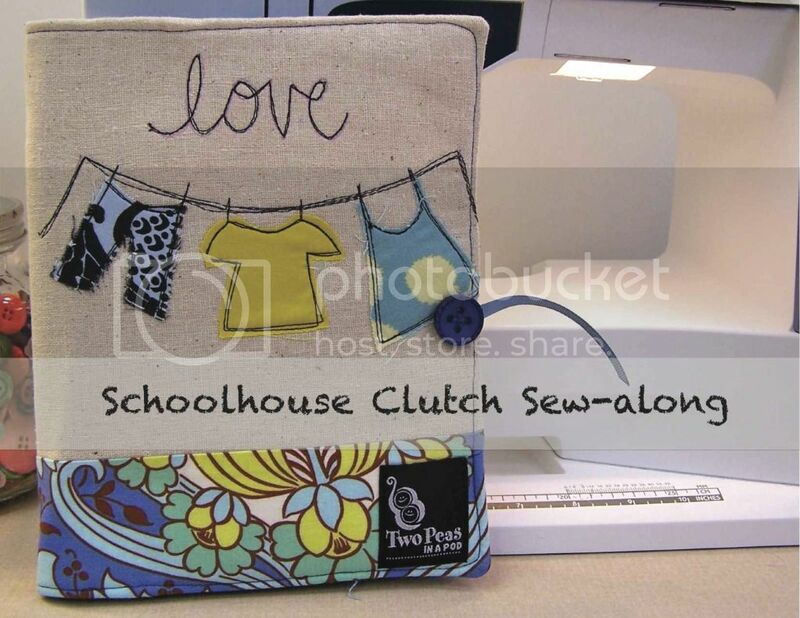 I LOVE LOVE LOVE my Schoolhouse Clutch pattern. It holds a full size notepad and it's just cute! These patchwork wristlets are perfect especially with a little gift card from oh, let's say Starbucks, inside! I am making my Mom one of these table runners this year but with a winter theme in blues and neutral colors and the words "let it snow"
The Hazel Hipster and the Mary Beth Messenger are both favorites of my nieces. 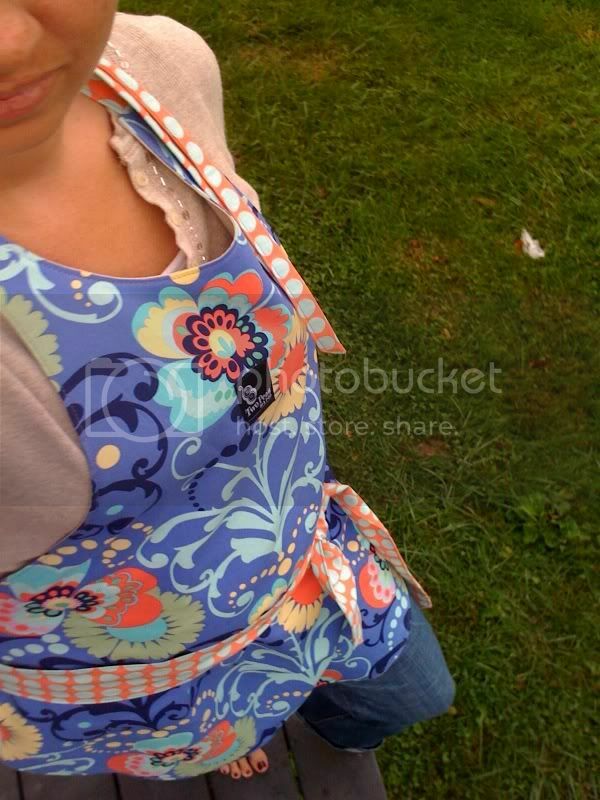 And for all your holiday baking...you can't go wrong with this adorable apron for YOU. I already have some fabulous holiday prints picked out and on my cutting table to make Patsy Ann Apron tops for my girls for our cookie baking this year. These are quick and SO easy!! One of my peas even made one herself this summer to wear as a top - but I'm anxious to make them a few Patsy Anns just for Christmas! AND Extra fun because you can wear it both IN the kitchen and OUT shopping! Bonus! 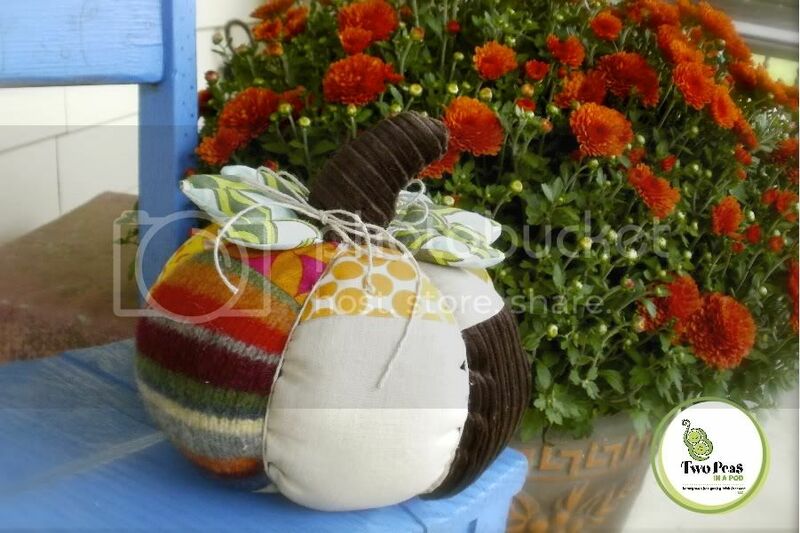 So, along with some free tutorial help here - I have pattern discounts to share with you too! 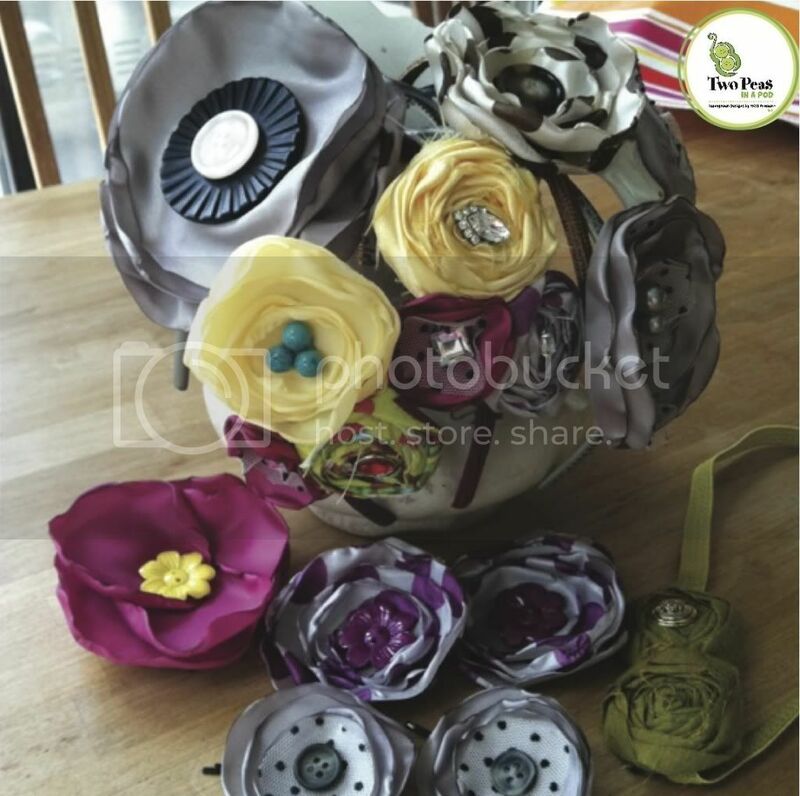 To help you with your handmade gift giving. One of my non-sewing friends a few years ago bought me a fat quarter bundle, a new pattern and a gift card to a local quilt shop. Best gift ever! ALL OF THE PATTERNS in my shop RIGHT NOW are 15% off. AND on top of that, buy any 3 patterns and get a 4th pattern free. Buy 6 patterns, get the 7th and 8th pattern free. (Limit of 2 free.). There are tons of handmade holiday ideas out there - do you have one to share? Leave your ideas in the comments section...and get busy on that crafting list so you can be done early and enjoy the holidays! Hmm...so what could it possibly be? The mystery continues! 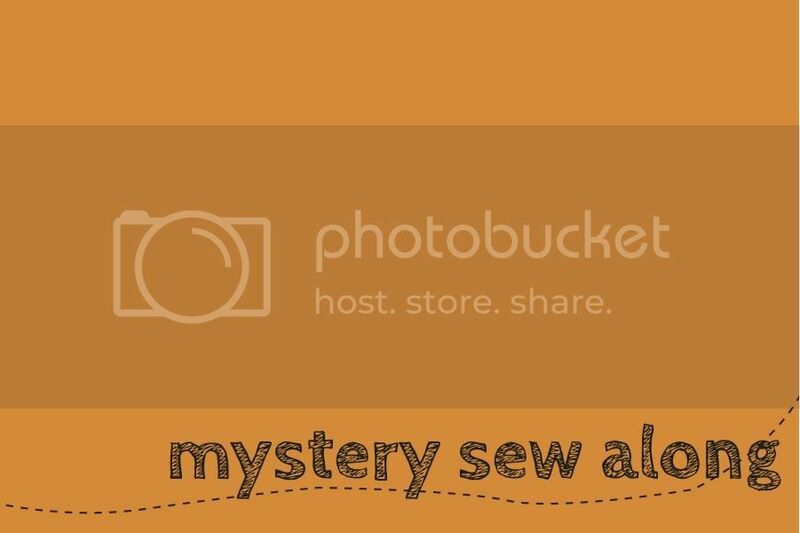 If you are just joining us, go back here to start from the beginning of our mystery sew along. 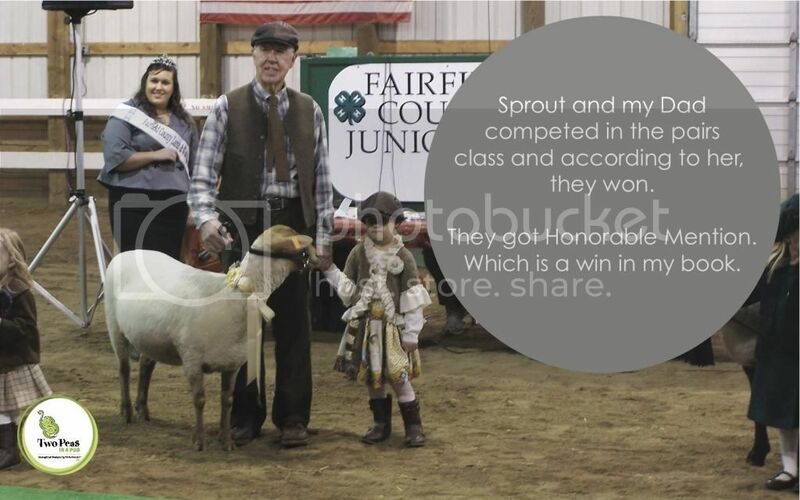 I am so happy to be sharing this project with you because it brings back fond family memories. My Aunt used to do TONS of craft shows when I was a little kid. 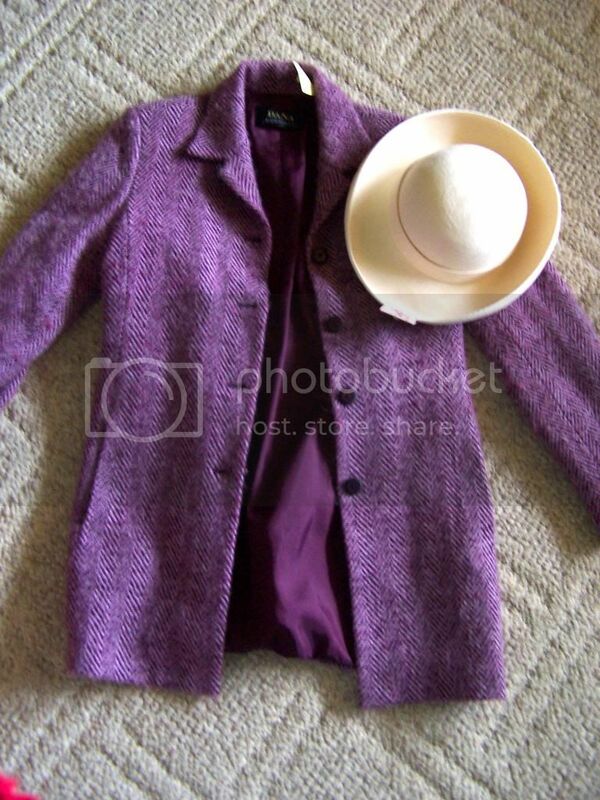 LOTS of seasonal items and this is a spin on something she used to make back in the 80's. Today, we are going to use a paper pattern. Right click on the pattern down below here, save it and print it out. You may need to do some adjusting on the size - your pattern piece should measure roughly 10 1/2" from point to point and roughly 4 1/8" at the center widest point. 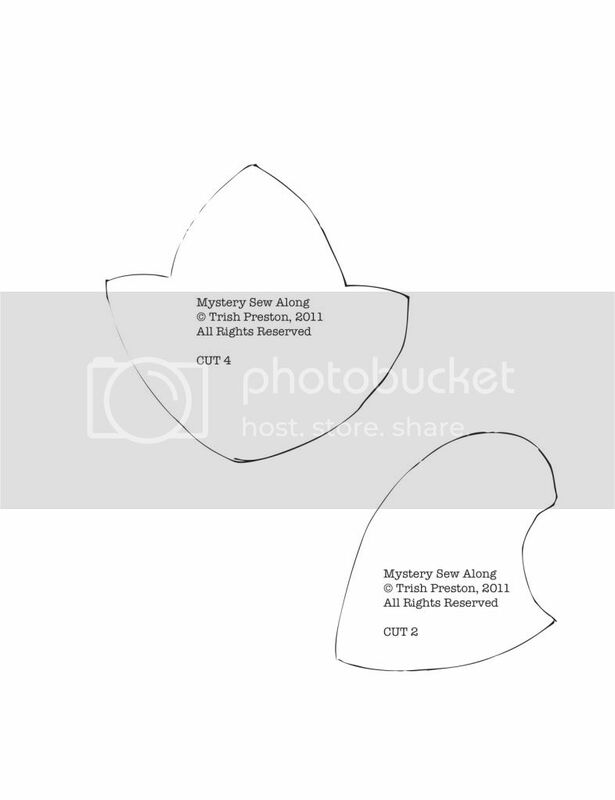 For this object we are making which shall remain a mystery for now, you can certainly alter the size of this mystery pattern to make various size mystery objects. Thought I was gonna say what the mystery object was, didn't you? Nope, it's still a mystery. Print out the template. Lay it out on your 6 panels you created yesterday. Center the template over the center block and cut out your pattern on each of the 6 panels. Now, take 2 of the panels and lay them right sides facing. 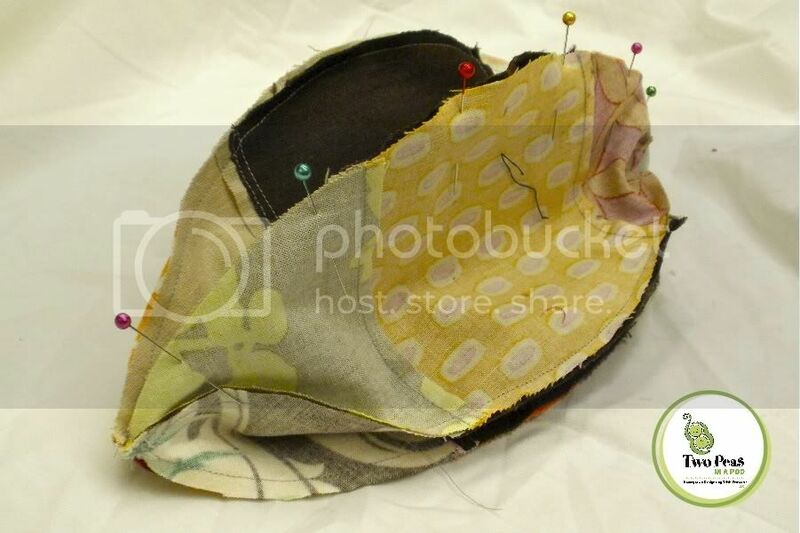 Pin and with 1/4" seams, sew down one long edge. Continue to add panels on in the same manner. You are forming a ball. Now...don't go blurting out if you think you now know what we are doing. Keep it a surprise. Just hold your horses! When you get to the last panel and you are stitching your "ball" closed, LEAVE AN OPENING about 3" long towards the bottom. Sew your corner points and come up just a bit from the bottom and leave that opening towards the bottom. Turn your "ball" right side out and stuff it firmly with your stuffing. Then slip stitch the opening closed. Wow. 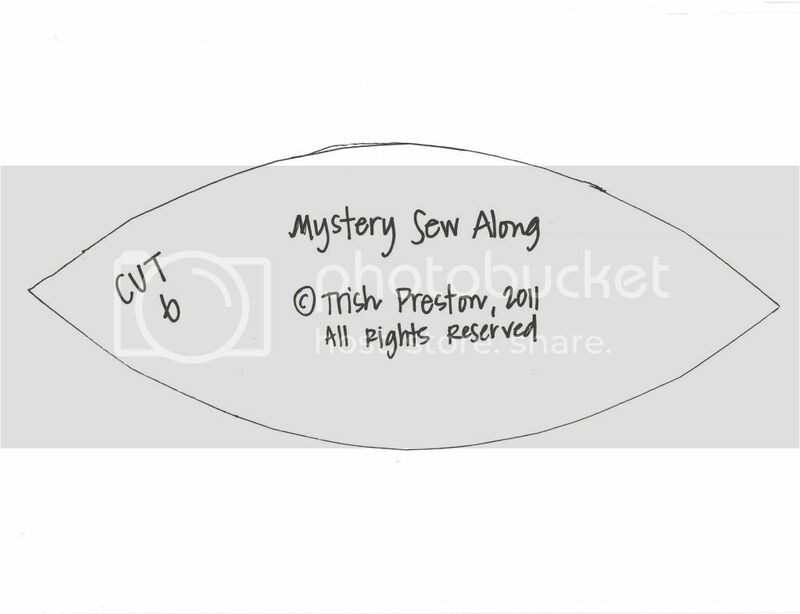 So we are making a mystery ball? No. No we are not making a ball. Come back tomorrow and you'll soon find out!